VINTAGE COSTUME ANTIQUE JEWELRY MATCHING JEWELRY SETS - PARURES! 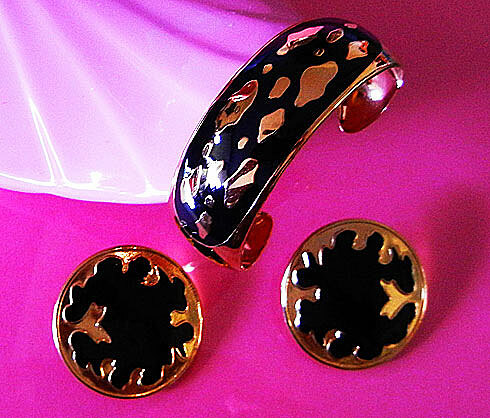 Jet Black Enamel High Polished Goldtone Cuff Bracelet And Post Earrings Vintage Estate Matching Jewelry Set - Parure. I sell Vintage Costume Estate Antique Jewelry Matching Sets Parures signed and unsigned. Please don't forget to also browse the necklaces, earrings, Bracelets, brooches and pins, bridal jewelry. All are high quality old antique estate collectibles - bakelite, Art Deco and beautiful vintage crystal rhinestone jewelry matching sets parures, Juliana jewelry matching sets parures and fruit salad jewelry matching sets parures. Signed Vintage Costume Estate Antique Designer Jewelry Matching Sets Parures include Weiss, Coro, Lisner, Miriam Haskell, Hobe, Trifari, Eisenberg and more. Circa 1920 through circa 1980. Read about the history of vintage estate antique earrings, vintage jewelry glossary and Annie Sherman Designer Jewelry Goes Hollywood. Not only are these collectible jewelry, they are beautiful wedding, bridal, bridesmaid, prom, pageant jewelry and fashion jewelry for parties, cruises and special functions! Every jewelry item comes with a lovely free Oriental silk jewelry pouch! Vintage Jewelry Gift Certificate. I Buy Vintage Estate Antique Jewelry. About Jewelry Appraisals. Vintage Fashion Accessories. Bridal Honeymoon Suite Hawaii Kona! 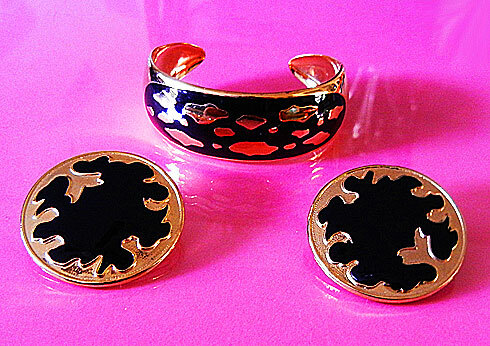 Item #S168303 - Jet Black Enamel High Polished Goldtone Cuff Bracelet And Post Earrings Vintage Estate Matching Jewelry Set - Parure. Size: Cuff Bracelet: Circumference 6 1/2" with a 1 1/4" opening. Earrings: 1 3/4". 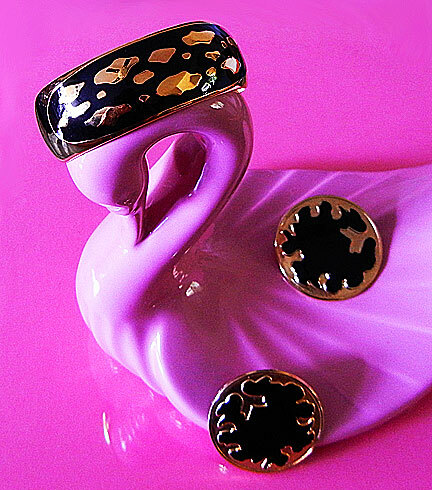 Lush jet black enamel adorned by high polished gleaming goldtone artistic patterns! Bracelet is hefty and well-made. Lustrous jet black and bright gold exudes a regal color contrast! Matching earrings are light weight designed for comfort. Post earrings for pierced ears. Pristine condition. A fabulous matching Jewelry set to wear at weddings, prom nights, pageants, parties, cruises and special functions! US$138.00.